This will surprise some who know me, but I have spent much of the month of May praying the rosary! This is a result of my first visit to a meeting of the Children of Mary at the Academy of the Sacred Heart, a Catholic girls school that I attended for fourteen years (Pre-K through 12th Grade). The Children of Mary is a group of women who meet regularly to deepen their spiritual life and to do various good works. Before this meeting on the first Saturday of May, we prayed the rosary, had Mass, crowned Mary, and sang the Marian songs I remember from my childhood. This gave me the incentive to spend the rest of the month of May praying a daily rosary. To my surprise, I am really enjoying it! I am certainly finding that the mysteries of the rosary have a far greater depth than I was able to realize as a child. 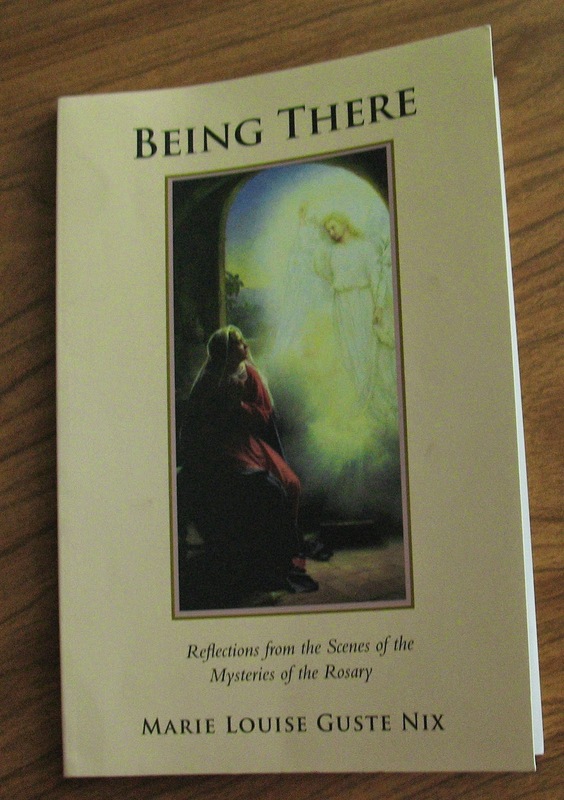 Seredipitously, it also happens that during this month, a classmate of mine at the Academy of the Sacred Heart, Marie Louise Guste Nix, has had her fourth book of poems published - Being There: Reflections from the Scenes of the Mysteries of the Rosary! As soon as my copy of Being There arrived, I read it straight through and found myself deeply moved. With Being There, Marie Louise has taken me into the thoughts and feelings of the people of the first century who actually lived through the events that we remember when praying the rosary today. To do this, Marie Louise draws upon her in-depth study of the Gospels, her deep prayer life including years of meditating on the mysteries of the rosary, and her skill and art as a poet. Marie Louise has been there time and again in spirit, in prayer, in meditation, and in imagination - and her poems take me there, too. Here are some of the poems that I find especially moving. "Simeon Remembers" - I feel Simeon's weariness of years as he faithfully performs the priestly ritual for child after child after child - each one loved and welcomed - until the day he holds the promised infant messiah in his arms. "Rock of Grace" - I hear a cousin of Jesus voice his love and admiration for Jesus and his deep concern and worry as he hears Jesus proclaim himself to be the promised one of God, knowing the jealous reaction that this will provoke. "Nightmare Impossible" - I enter into Jesus' very human pain as he carries his own cross - the physical pain of each excruciating step after step after step and the emotional pain of mourning for what seems the loss of his life's mission. "Our Mother Is Taken to Heaven" - I listen as Mary's nurse describes her joy in caring for Mary in the last years of her life and of being there when Mary is assumed into heaven. One of the things I appreciate most about Being There is the ability of Marie Louise to immerse me in Jesus' world. I experience Jesus as a member of a close-knit extended family, of a village where everyone knows each other, of a people united in their destiny as God's chosen and in their longing for the promised messiah. I should mention that Marie Louise's poems are accompanied with beautiful artwork by Michelangelo, Rembrandt, and other masters, and that Marie Louise also provides questions to aid one's own reflection on the mysteries of the rosary. Already, Marie Louise's poems have beautifully influenced my own meditation on the mysteries of the rosary. I recommend Being There, not only to anyone who prays the rosary, but to anyone interested in a fresh perspective on the events of the Gospels. Eighteen of the twenty mysteries of the rosary are straight from the Gospels and/or the Acts of the Apostles, the two exceptions being the fourth and fifth glorious mysteries (the assumption of Mary into heaven and the crowning of Mary queen of heaven and earth).